The United States Congress designated the Harquahala Mountains Wilderness (map) in 1990 and it now has a total of 22,880 acres. All of this wilderness is located in Arizona and is managed by the Bureau of Land Management. In the language of an early native tribe, Harquahala translates to “running water high up.” This elevated region, set on one of western Arizona's largest desert ranges, was so named for its numerous perennial seeps and springs. The Harquahalas rise from 2,100 feet to just short of 5,691-foot Harquahala Peak, which sits just outside of Wilderness boundaries. From the upper elevations of this wilderness, panoramic views includes the surrounding desert and mountains up to 100 miles away. Natural mountain springs support a rare habitat among Sonoran Desert mountains, a screened interior canyon system with exceptional natural diversity. Rare cacti live here among relict "islands" of chaparral and desert grasslands. Here you'll find high peaks and foothills, deep rocky canyons and valleys, as well as ridges dropping to bajadas. Common vegetation includes saguaro cactus, ironwood, palo verde, creosote bush, ocotillo, and cholla. Sunset Canyon falls 1,600 feet from the steep east rim of the mountains. Brown's Canyon, which stretches for nine miles across the northeastern portion, houses the endangered desert tortoise and is seldom visited. This area also sustains the largest mule deer herd in western Arizona, a sizable raptor population, and one of the few increasing desert bighorn sheep herds. In the 1920s the Smithsonian Institute built an observatory on Harquahala Peak and a rough trail for mules to carry up supplies. The obscure Harquahala Peak Trail runs about 5.4 miles one-way to the ruins of the observatory; rock cairns mark the way. The rest of the Wilderness offers some of Arizona's most appealing desert solitude . . . but be forewarned, summer temperatures can send the mercury to the top of the thermometer. When conditions are on the milder side, temperatures usually range from 90 degrees Fahrenheit in July to 48 degrees in January. This area only receives about 6 inches of rainfall, annually. 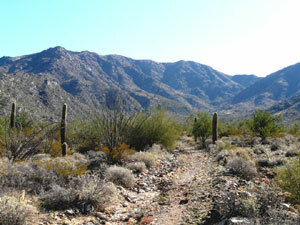 Planning to Visit the Harquahala Mountains Wilderness? How to follow the seven standard Leave No Trace principles differs in different parts of the country (desert vs. Rocky Mountains). Click on any of the principles listed below to learn more about how they apply in the Harquahala Mountains Wilderness.